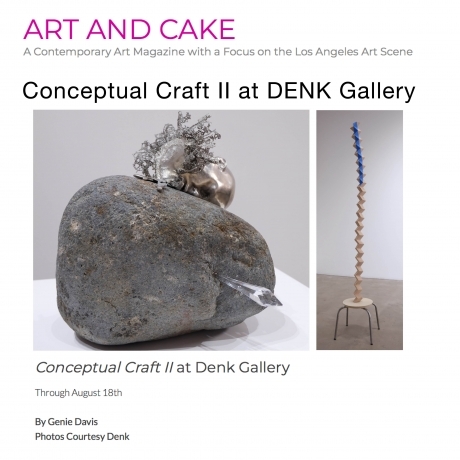 (Los Angeles, CA) - DENK gallery is pleased to present Conceptual Craft II, its highly anticipated follow-up to Conceptual Craft, the show's first iteration in September of 2017. A thematic continuation of the first, the exhibition features new and recent works by a freshly curated group of 12 Los Angeles-based artists, all of whom are working with sculptural media through process-inflected approaches, varying from the minimal to the narrative. 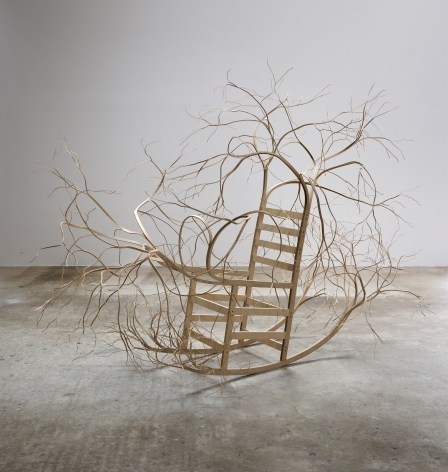 The show emphasizes a return to the studio and its material interests in "crafting" the object as a vehicle for concept. Highlighting the interdependence of ideation and process, Conceptual Craft II presents works that express content through the material concerns of their physical making. The exhibition explores the conversion of the immaterial to the tangible through the obsessively hand-made. 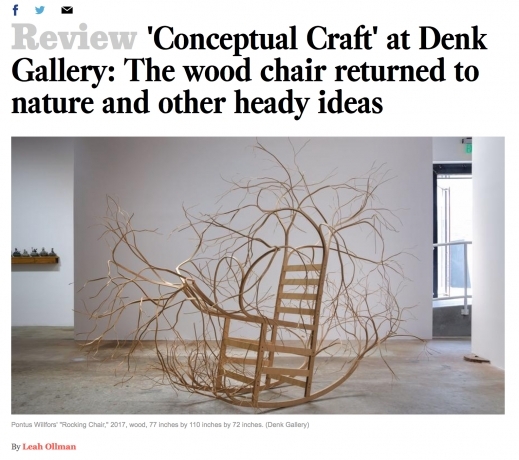 "Craft" in this exhibition is proposed as a conceptual process of object making and transformation, with the artist placed firmly at the helm of their studio production. Rather than pitting the development of concept and the creation of the object in opposition as extraneously competing concerns, the artists in Conceptual Craft II focus on the integrative nature of their ideas and the physical process of their materialization. 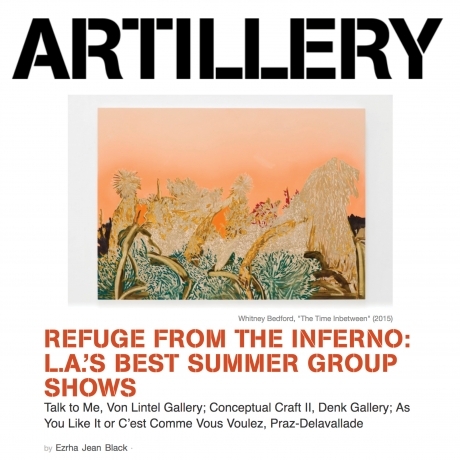 The mutually defining reliance of concept and execution has cultural roots in LA. Historically, Los Angeles as an art center has a unique legacy of fabrication and manufacture; the city's varied history has included everything from aircraft and aerospace innovation, to custom car culture, industrial design, architecture, film, and television production, and, of course, the material-based practices of the Light and Space Movement, epitomizing this close interaction of concept, material, and manufacture. 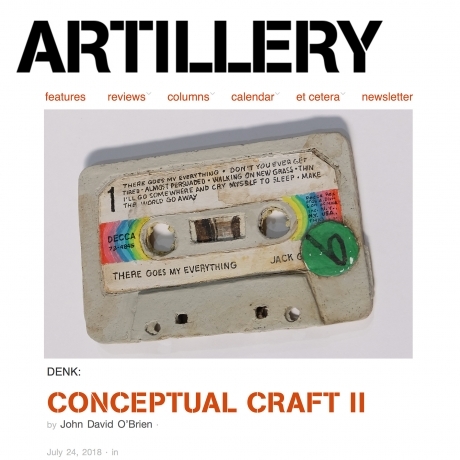 This legacy resonates throughout Conceptual Craft II as a peripheral constellation of themes and unites an exciting cross-section of contemporary artists with vested interests in the conceptual valence of objects. Conceptual Craft II features works by Gioj de Marco, Sean Duffy, Tim Ebner, Joséphine Wister Faure, Kristen Morgin, Rachel Lachowicz, Tom LaDuke, Patrick Nickell, Michael Pierzynski, Tia Pulitzer, Ross Rudel, and George Stoll. Gioj de Marco works in sculpture, photography, and multimedia installation, exploring identity politics and the complex material expression of personal and cultural narratives; for the exhibition, she'll be creating a sculptural confessional to scale. Tim Ebner's works are powder-coated steel "paintings," minimal, topographies of physical impact. Sean Duffy, a painter and sculptor known for his interest in material paradox and the physical trace, offers a backgammon set that shadows and expunges the gestures of the game with graphite and eraser pieces on paper. Rachel Lachowicz, known for her smart feminist re-appropriation of canonical art historical works, is represented by an acrylic, freestanding sculptural composition, nebulously reminiscent of the translucent resin boxes by Peter Alexander, born of the Light and Space moment, and even Yves Klein's much earlier claim to a patented proprietary blue. Tom LaDuke creates labor intensive dimensional paintings and hyper-realistic sculpture with surreal intuition; his piece for the exhibition combines a polished human head cast surrounded by ornate metal filigree, precariously staged face down in an inanimate rock mass. Kristen Morgin assembles clay facsimiles of everyday objects, urban detritus, and nostalgic castaways, delaying our recognition of the object's material make-up with an impressive trompe l'oeil technique executed in unbaked clay. Patrick Nickell creates minimal glass sculptures evolved from earlier pieces made from found materials and urban remnants. Michael Pierzynski transforms and plots suburban thrift store castoffs into evocative narrative sculptures. Tia Pulitzer creates ceramic pieces of beautifully absurd and fantastic animalia. Ross Rudel, sculptor and performance artist, creates thoughtful and meticulously organized objects, often invoking nature, biology, and the body. George Stoll, known for handcrafting objects to resemble subtly imperfect mass-produced ones, like Tupperware, sponges, and the like from wood and beeswax, has created delicately balanced, formally minimal wall-mounted sculptures. Joséphine Wister Faure is a conceptual artist working with film, performance, and installation to develop sensory and experiential encounters. The exhibition will feature a series of her "peephole" works. These wall mounted boxes offer moments of staged consensual voyeurism and invite the viewer to peer into a series of handmade dioramas as witnesses to the residual evidence left in the wake of some unseen event.